Bake French bread as directed on can. Remove from cookie sheet to cooling rack. Let stand at room temperature at least 12 hours or overnight until dry and crusty. When ready to serve, heat oven to 375°F. Cut bread into thin slices; place on ungreased cookie sheet. Spray both sides of each slice with cooking spray. Bake 10 minutes or until lightly browned and crisp. While crostini are baking, place fine mesh strainer over medium bowl. Pour soup into strainer to strain out onions. Put onions in 2-quart saucepan. Reserve broth for another use (see Tips). To onions in saucepan, add cream cheese; cook over medium-low heat, stirring occasionally, until cheese is melted. Add Gruyère cheese; cook and stir over low heat until cheese is melted. Pour dip into warming dish or small slow cooker. Garnish with green onion. 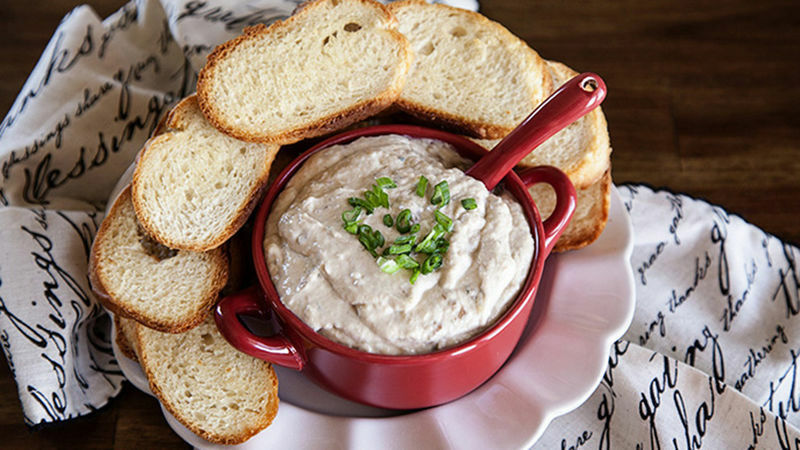 Serve warm dip with warm crostini. This appetizer can be made a couple days in advance and rewarmed for your event, saving on time the day of your party. Save the broth from the soup to add to other dishes for an extra bit of flavor.